Starting today all Pingdom users can try out our new and improved public report pages, seen here below. These reports, also known as status pages, let you make some or all of your Pingdom monitoring results public, promoting transparency toward your users. 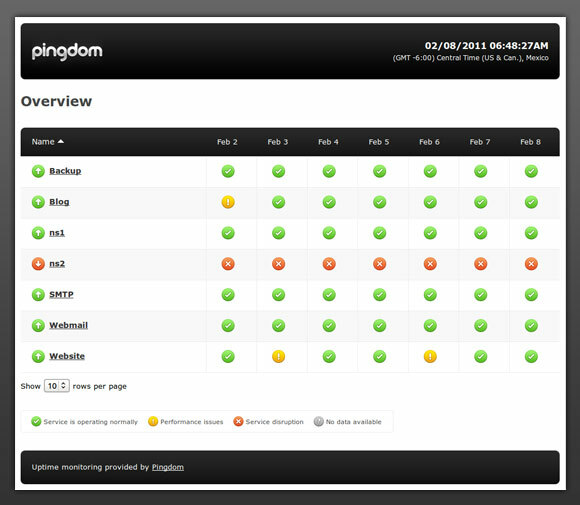 Since the public reports are hosted by Pingdom, they will be available even when your own website is down. They are very handy as automatically updated public status pages for web services and hosting companies, to name one example. You can look closer at any individual check to get plenty of more information and graphs. And there’s actually more than what we showed you here above. 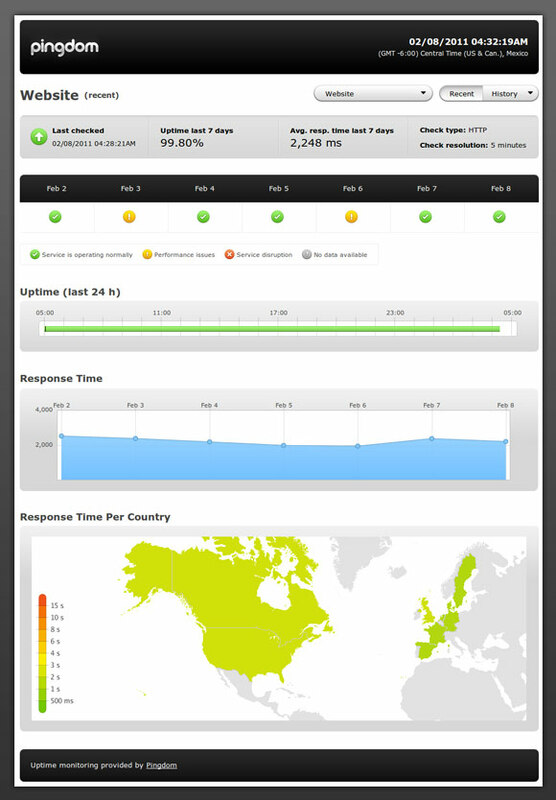 Uptime and response time charts. Customizable history (how far back in time the reports go). To try out the new public reports, just go to the public reports section in the Pingdom control panel and the information you need is right there. They’re already active for all Pingdom users, both free and paid. Update: Changes to the Pingdom plans means public status page is not available on our free plan. The old public reports will still be working as usual during this transition period, but will be phased out when the beta is complete. We will let our users know in good time before this happens. There are many more Pingdom features in the pipeline for 2011 (and beyond). This is going to be a great year for us and for our users, and we thank you for being part of this journey. That’s awesome! What a clever idea. I think we’ll defo be using that for our clients once we’re set-up properly. Note: Your overview table might be hard to read. All indicators have the same round design. While scanning the page it might be hard to see the difference between “v” and “!”, and even “x” is on the edge. Very nice reports. However, I’d like them to appear under my own domain e.g. uptime.mydomain.com. I’d imagine that all the new inbound links to pingdom couldn’t but help either. Jon: Good suggestion and we’re actually considering this. The more people who want it, the higher the likelihood of us adding it. Please send your feedback to beta -at- pingdom.com if you haven’t already, and any other thoughts you may have. The reports, though, show something that still bugs me about Pingdom – I can’t define regular maintenance windows for applications. It would be great if we could schedule checks (or to keep data more accurate, alerts) to be paused at certain times. Now, the only way to do it is manually. Also, any chance we could change the criteria for green/yellow/red? All of our apps that have these maintenance windows show yellow every day because of a few minutes of “downtime”. Because for us it’s acceptable to have a slightly higher downtime level, it’s not something we really want to be warned about unless it exceeds our expected downtime of a few minutes per day. Hope that makes sense. Thanks for launching this. @Michael Downey: Great feedback, and much of what you’re talking about will come eventually. Please send any feedback to beta -at- pingdom.com. It would be greatly appreciated. That looks awesome. I agree with Stijn, though. A bit “noisy”. Yet a big improvement. Not working for me. All I get is a 503 Service Unavailable. @Ludvig: Sorry about. We had a temporary issue with the web frontend, but it was fixed quickly so try again please. Oh.. How disappointing. This is really just for the *public* reports. My private ones still look like before.. Meh..
@rafa: The control panel and your “private” reports are in for a big overhaul coming soon. If you liked the new public reports, you’ll love them. The reports look good and it’s nice to be able to customize it. Great work guys! We are using public reports from Pingdom for years. I wonder why that idea did not came from them before, as using third party reports are more reliable and honest then host your own. Still if they want to hit a niche with this they must allow paid users to brand their reports, or dont allow public reports for free accounts. That is a pretty huge incentive to upgrade from paid to free. We always had a paid account but suddenly Pingdom started to offer free accounts as well. We and most hosting companies use Pingdom only for public reports as using it monitor thousands of sensors would be to expensive. We have our own monitoring server so why would be bother to use a paid account if we get everything we want with the free one? The 1 free sensor is ok, its a freemium model butb they should limit it on features so people actually upgrade to a paid account. My report link (http://stats.pingdom.com/iw06fk5uadq8) just goes to a 404 page. Also, great to hear that the enhancements mentioned in these comments might be coming soon. I really like the one regarding scheduled maintenance windows. One more feature I’d really like to see is the ability to limit checks to specific monitoring locations (or be able to include/exclude regions). All of our servers (and customers) are in the US. Having our services monitored from locations around the globe severely inflates our average response time, and this wouldn’t look good in our public reports. @Brendan: Thank you for the feedback. Regarding getting a 404 page, please make sure that you have not unchecked “Show Overview” in your public report Settings. That removes that specific overview page of all selected checks, which is why you’re getting a 404 error. We’ll look into changing the wording of that to make it more clear what it means. I would like to have a customised page with our my own domain name as well. It is an awesome feature! Hope you consider Jon’s suggestion. Will be nice also to integrate this reports in WHMCS software, in order to be seen only for customers. Thank you Pingdom for your tools. Wow this is fantastic! It looks great. I especially love looking at the downtime charts where I can see the exact unavailability times graphically. Nice! Looks fantastic, thanks guys! I love your service. First I would like to congratulate You for job well done, new public report looks so fresh. I was worried regarding performance because first day it was slower than already slow public report, but few days later I see You have moved to new server and everything loads instantly. It’s only shame I don’t have more servers so I can get premium account to support your service i tried many uptime services and this is by far best one. I know these are comments for the beta of the new Public Reports (which is very nice by the way), but I can’t agree enough with Hasitha and Bono. An Android app would not only be greatly appreciated, but essential. Here’s another vote for Android! We should be able to define regular maintenance windows. Thanks.